Whenever the Billy Graham Library requires an audiovisual upgrade, technical coordinator Tim Sieber calls Video Corporation of America (VCA), ranked number 15 on SCN's 2017 list of Top 50 Integrators. Sieber has long trusted the guidance and direction provided by Southeast regional account executive Mike Wenhart. Dedicated in 2007, the Library offers a unique experience to honor Graham’s life and mission. Through “A Journey of Faith,” visitors experience an automated and self-guided tour through multimedia presentations, kiosks, and memorabilia in a barn-shaped building sitting on 20 acres in Charlotte, NC. The complex also includes Billy Graham’s restored childhood home, a dairy bar, and a museum-style gift shop/bookstore. The visitor count, typically about 500 per day, has nearly doubled since Graham’s recent death. Numbers increase at peak times when the Library hosts book signings, speaking engagements, and other events. The Library maintains existing legacy gear, predominantly a Crestron control system throughout the entire facility, along with show control from Alcorn McBride as part of the distribution system. VCA has performed various refreshes, the latest of which involved upgrading projection systems. “Previously, the theater had projectors with lamps; they were spending thousands of dollars a year on these lamps, which had to run six days a week, eight to ten hours a day, and often longer, particularly at Christmastime,” Wenhart noted. In this refresh, VCA installed three new Christie Laser DHD850 Projectors. 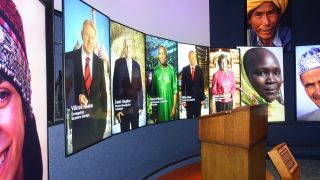 The projection is edge blended and warped for a single image on a ten feet high and 35-feet wide curved screen. In addition to providing a uniform image and reducing costs, the Library saw impressive savings in labor costs. In order to change out lamps, staff had to spend long hours—often all night long—removing bolted-in theater seats to gain access. As visitors leave the theater, crosses dart through the video images, coming faster and bigger as exit doors open, leading the way to another space where a floor to ceiling Thomas Kinkade mural and glass archways, carved with crosses, are illuminated by LEDs. In addition to the new theater projection system, VCA installed several Sony projectors including VPL-FHZ60s and VPL-FHZ700s in various spaces, as well as five Sony 65-inch FWD65X750D LED displays mounted portrait mode with one for a spare. Technology aside, it’s the relationship between VCA’s Wenhart and the Library as a client that contributed to the success of the project. Sieber typically asks Wenhart if a particular idea is doable. One such idea is a system to accommodate non-English speaking Library visitors. “We’re looking into logistics for language translation and have come up with some products for a possible future project,” Wenhart said.